Write For Seeme and Liz! In order to submit a guest post you must either have a website in the parenting, child development or learning through play niche or be a professional in child development (teacher, pediatrician, Early Childhood Educator, Occupational Therapist, Speech-Language Pathologist, etc.). If you are a freelance writer, SEO service provider or are looking for a sponsored post you may contact me via email tanya(at)seemeandliz.com and I will send you my media kit including fees. ***Freelance writers must have experience writing in the parenting/child development niche. Please send links to some relevant articles you have written. ***A sponsored post is one where you are promoting your own product(s) or service and the links go back to your business. The article can be written by either myself or you. ***All paid links will be nofollow as per Google’s Guidelines. Make sure to check your junk folder if you have sent me an email and think I haven’t responded. My responses often end up there. ♦ I will share your post on Social Media (Twitter, Facebook, G+ and Pinterest) several times during the week it is published. ♦ If I really like your post I will add it to my “recycled posts”. I use Social Jukebox (for Facebook and Twitter promotions) that allows me to add my favorite tweets and it will randomly send out a predetermined number of tweets each day. This means extra exposure for you! I will also pin your article to my applicable Pinterest boards. ♦ You can include one link to your website in your “author bio” as well as links to up to 3 social media accounts. 1. No Affiliate Links, link stuffing or link selling! 2. It is of the utmost importance that your article has been checked for grammar/spelling mistakes and that the text is broken up by paragraphs and subheadings. Articles submitted that need extensive revisions will not be accepted. 3. If your article is not optimized for SEO I may make some changes in that area. I will send you the article with any edits that have been made prior to publishing it on the site. 4. Your article must be 1000+ words (not including your author bio). 5. Your article must contain an introduction and closing paragraph. 6. Only original content may be submitted. Do not copy all or parts of an article found elsewhere online, including your own website. Google isn’t a fan of duplicate content and I would like to stay on Google’s good side! 7. The article must fit in with the topics on Seeme and Liz. 8. You have experience writing in this niche (parenting/child development) on your own website or you are a parent, teacher, caregiver or other professional focusing on children and their development. 9. If you have your own product to promote this will be a sponsored post (see above note regarding these). You may write this article yourself or I can write it for you. Please contact me at tanya(at)seemeandliz.com to discuss fees associated with this type of article. 10. You may include your own images assuming that you have the rights to use these images online. If you choose not to provide images I will add these myself. Images must be attached separately in an email and not within your article. NOTE: I will edit all images to fit with the various social networks. 11. An author bio must be included at the end of your article (2-3 sentences). You may also add an image of yourself or your blog/website logo. Images can be sent via email once your article has been accepted. 12. If you have a blog or website, make sure you include the URL in your message to me so that I can take a look at it. 13. If you are referring to studies or facts in your article, please include links to back up this information. 14. Submissions must be sent as a google doc. To give you a better idea of what Seeme and Liz is about click here. You are more than welcome to write about other topics I might not have mentioned as long as the topic fits in with what Seeme and Liz is all about and that is that children learn best through play! But even better, download my free e-book to get a better sense of articles that would be a good fit. If you are interested in having your article featured on Seeme & Liz, please submit the article via google docs to tanya(at)seemeandliz.com . I will only respond to serious inquiries. 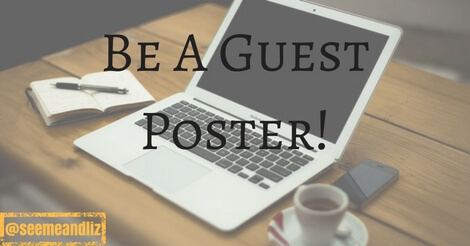 All accepted guest posters will be notified via email. I receive many inquiries therefore I will only respond to those whose articles have been accepted.